The Color item will display the standard color picker widget available on your particular platform. On MacOS and Windows, the color picker even contains an eye-dropper that will allow you to select any pixel color on your screen which can be super handy. After selecting the color, click the Choose button to copy the RGB color value to the clipboard. 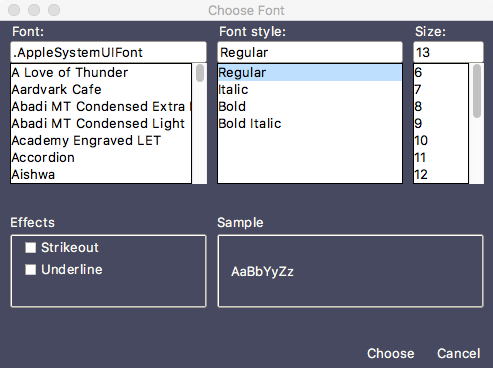 The Font item will display the font picker widget which will allow you to select a font family, weight and size, including the ability to add underline and strikeout features to the font. The resulting font string value will be copied to the clipboard when the Choose button is clicked. The Directory and File items allow you to browse your file system for a given directory/file using open file browser available on your particular platform. Selecting the Open button will copy the pathname to the clipboard. Just some handy plugin functionality to help make your programming workflows better. 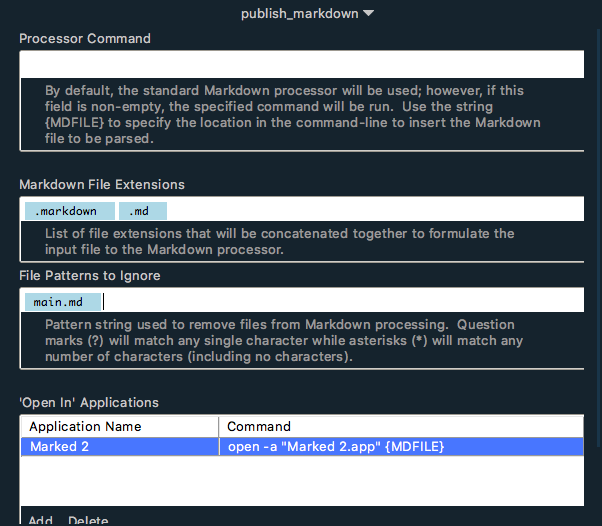 In TKE 3.2 a new plugin called the “Markdown Table Beautifier” is included which, when run, cleans up any table syntax found inside of a Markdown document. This essentially involves, making all table columns be vertically aligned and all cell contents be justified according to their column justification indicators. It also will adjust all rows to include the maximum column specified within a table row. All of this cleanup helps make Markdown tables easier to read in Markdown format. Essentially the Markdown Table Beautifier plugin can run on all tables found within a single Markdown file or it can run only on the table where the insertion cursor is within. To install the plugin, select the Plugins / Install… menu option, find the Markdown Table Beautifier plugin in the resulting list, highlight it and hit the RETURN key. Once the plugin has been successfully installed, you can run it by simply selecting the Plugins / Markdown Table Beautifier submenu and choosing one of the two available options to beautify all tables or only the currently selected table. Note that these menu options will only be enabled if the file syntax is either Markdown or MultiMarkdown. Clean and easy to read tables without the fuss? Check and check.